Goa- the land of sun, sand and beach, is probably a favourite amongst tourists across the globe. This small state is located along the west coast of India and is especially popular amongst visitors from abroad. Its rich cultural heritage has strong influences of the Portuguese culture with many residents hailing from that lineage till date. The effervescent and lively people with their warm and extremely welcoming hospitality forms the very heart of the State of Goa. If you are going for a trip with friends, Goa is the place to be! Going on a trip requires meticulous planning that is budget friendly and suits every person on the trip. We present to you the list of the best cheap hotels in Goa that are pocket friendly, comfortable along with basic amenities to make your holiday worth it. M The Business Hotel: Located in Vasco Da Gama area of Goa, this quaint hotel is ideal for those who are travelling on a budget. Complete with basic amenities, clean rooms, complimentary breakfast, air conditioning, etc. it is perfect for young travellers or group of friends. It is located close to the airport in South Goa. You can enjoy a comfortable stay at this budget friendly hotel during your holiday in Goa. Dona Sa Maria: A budget friendly and extremely hospitable hotel is located in Cavelossim vicinity of Goa. It is run by a humble Goan family and offers basic amenities to make your stay as comfortable as possible. You can enjoy typical home-made Goan cuisine along with a full-fledged bar/lounge service to make your trip even more enjoyable. Whether it is a getaway with friends or a vacation with your family, you will be in for a pleasant surprise at this quaint budget / cheap hotel. Colonia Jose’ Menino Resort: A very pocket friendly and warm resort located close to the beach in Varca, this quaint resort is a delight to spend your vacation in. Equipped with basic amenities, free parking, complimentary breakfast, beachfront and swimming pool, etc. this resort is apt for friends and family alike. If you are planning a long vacation in Goa and want to spend as little as possible for your stay, then this is definitely the place to be. Treebo Green Park: A gorgeous hotel located on Mapusa-Panaji Road, is a travellers delight. If you are looking for comfort and basic luxury then Treebo is the place for you. Complete with all amenities, pool facility, complimentary breakfast, room service, full-fledged restaurant, etc. you can be sure to enjoy a memorable stay at this hotel. Although a little far from the beaches, but you can always hire a bike to roam around Goa and still enjoy a comfortable stay at this hotel. Genuinely one of the best cheap hotels if Goa. The Sapphire Comfort Hotel: If you are on a look out for a cheap and comfortable hotel in Goa, The Sapphire Comfort is just for you. Located conveniently in Margao, close to Colva beach, this hotel is apt for a group of friends as well as families alike. With all basic facilities in place, hygienic bathrooms, air-conditioned, complimentary breakfast and comfortable rooms, you can be sure to enjoy a sound stay at this quaint hotel. If you are not really looking for an extravagant stay, but a budget friendly place, this hotel is just apt for you. Great food, great ambience and warm hospitality are the USPs of this hotel. Silver Sands Holiday Village: Located conveniently at a stone’s throw from Candolim beach, this quaint oriental style cottage hotel is a great place to stay. Whether you are travelling with a group of friends or with your family, you cannot miss the hospitality exuded by the hotel management. It is very close to various restaurants in and around Candolim area and are a great place to enjoy a comfortable stay with friends. Hygienic rooms, clean bathrooms, restaurant, room service, air-conditioned and great interiors set this hotel apart from its contemporaries. Since it is located in North Goa, it is definitely worth every penny due to its proximity to many other areas surrounding it. The Banyan Soul: An amazing and quaint hotel located behind German Bakery near Anjuna beach, The Banyan Soul is truly a soulful place to enjoy your vacation. A perfect getaway for family and group of friends, this budget friendly hotel is not heavy on your pocket and offers all basic amenities that you would want on your trip. 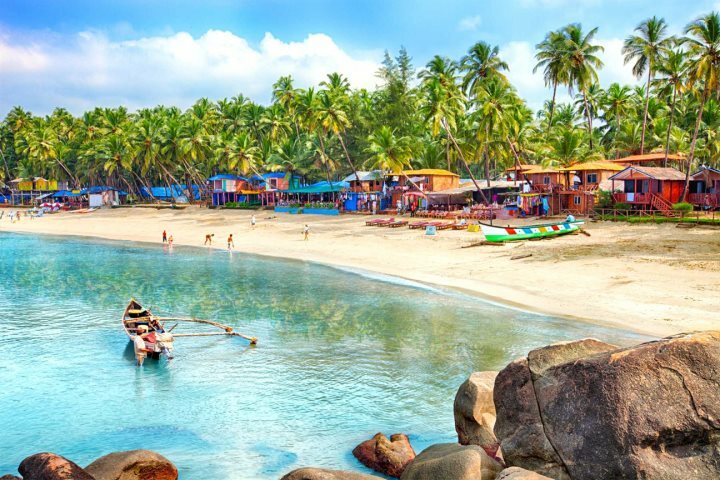 Enjoy the Anjuna flea market along with sightseeing in Goa while staying here. Escape the monotony of city life and spend an amazing time with friends at some of the best cheap hotels in Goa today!